This EA will recover your losing trades and turn them into winners using hedging. It provides several automated entry strategies, but should not be used as a set-and-forget EA. The purpose of this EA is to recover losing trades, not to make wild profits in the tester. It should not be used as a set-and-forget EA, nor evaluated as such. The EA backtests in a linear fashion, meaning that the compounding effect of profits won't be noticeable in the tester. Hedging EA will turn your losing trades into winners using a unique imbalanced hedging strategy. Once the initial trade moves into negative territory a predefined number of pips, the recovery mechanism will kick in: it will place a limited amount of alternative trades above and below the current price, until all of them can be closed with a small net profit. The initial trade it is managed independently to avoid performing a recovery at all. First, the EA tries to perform break-even to assure capital preservation. Secondly, the EA applies a configurable trailing stop and take profit. If the trade goes straight into negative, the EA performs a recovery. The hedging process is fully customizable in terms of behavior and risk. The recovery will succeed in most instances and fail in a minority of cases. If it fails, it incurrs into a calculated loss. 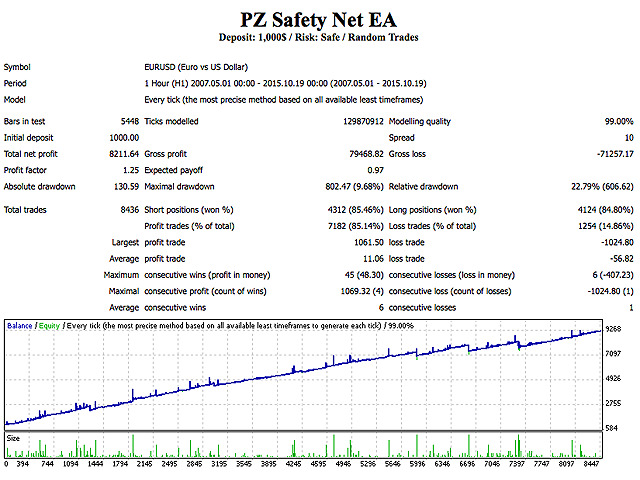 This EA offers a complete hassle-free trading framework. Once configured, it allows simple trading from the chart buttons: buy and sell. The EA will draw the chart buttons when it is ready to manage trades and hide them when it is busy, to avoid human errors. This parameter controls the size of the initial trade. A smaller lotsize decreases the net exposure of the deal. 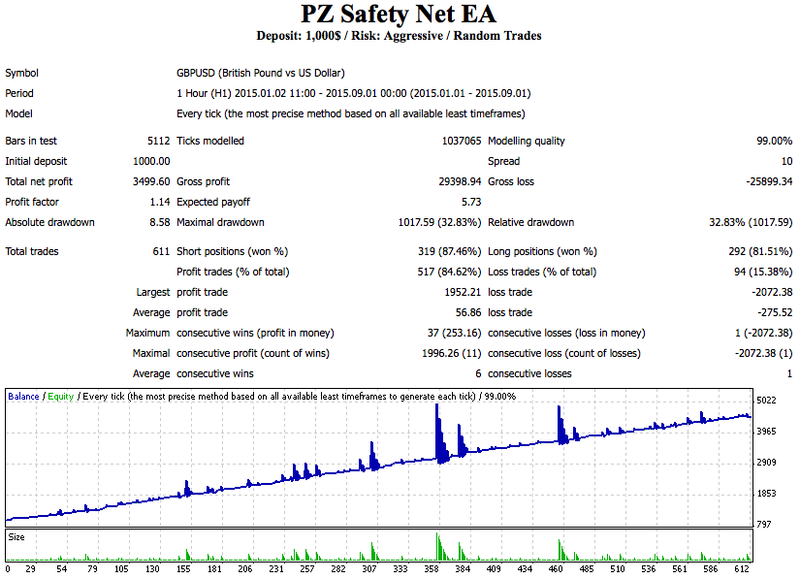 This parameter controls at which profit in pips the EA moves the stop-loss above/below the open price securing profits. This parameter only affects the first trade, not during the recovery process. Upon break-even, the EA can secure half the profits of the trade or move the SL to the open price, as you wish. If you want to let profits run and maximize the first trade, choose the latter. Percentage of the max. favorable excursion (MFE) used as trailing-stop. A small value is a tight stop, and a big value is a wide stop. This parameter only affects the first trade, not during the recovery process. 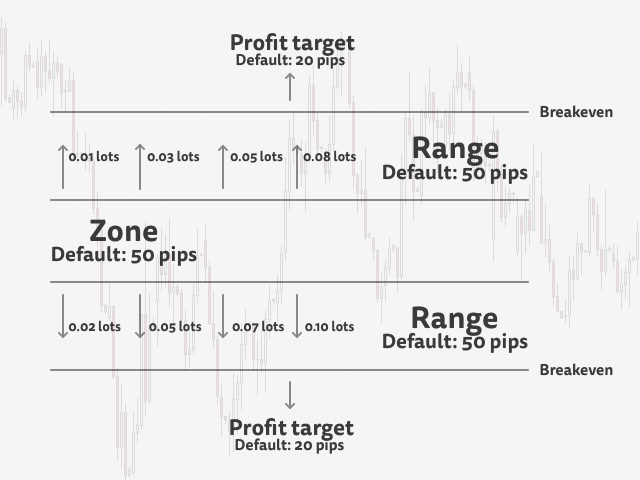 Minimum increase in pips for the trailing stop value and, at the same time, the minimum distance from the new stoploss and the current market price. This parameter only affects the first trade, not during the recovery process. Steath take-profit for the first trade. Not used during the recovery process. The EA implements a set of automated entry strategies to provide some degree of automation. Not all entry strategies will greatly perform in all market conditions, but you can switch between them as you see fit. Supported entry strategies are CCI, ADX, RSI, Bollinger Bands, AC, AO, Alligator, Fractal Breakouts, MACD, PSAR, RVI, Stochastic, Heiken Ashi, Turtle Trading, Breakouts, Buy Constantly, Sell Constantly and Random Trades.. If you choose to trade using your own custom indicator, type the indicator name in this parameter. The EA will call it via iCustom() internally. For more information about this, read the user guide. If you choose to trade using your own custom indicator, type the signal buffer number in this parameter. The EA will call it via iCustom() internally. For more information about this, read the user guide. 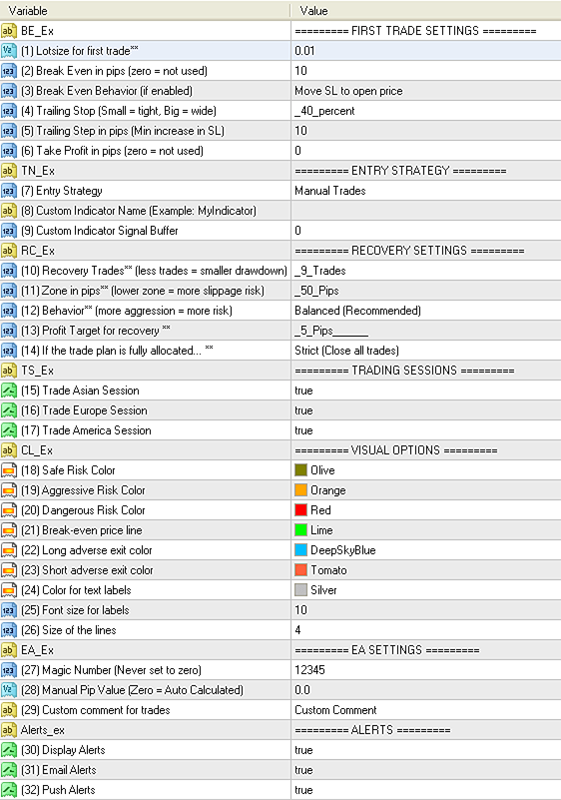 Maximum amount of trades to place during the recovery process. Distance in pips between buy stop and sell stop orders. A higher value will decrease trading frequency but will make deals to last longer. If the spread is below one pip, you can use a zone of 50 pips. If the spread is between 2 and 3 pips, you should set a zone over 75 pips. 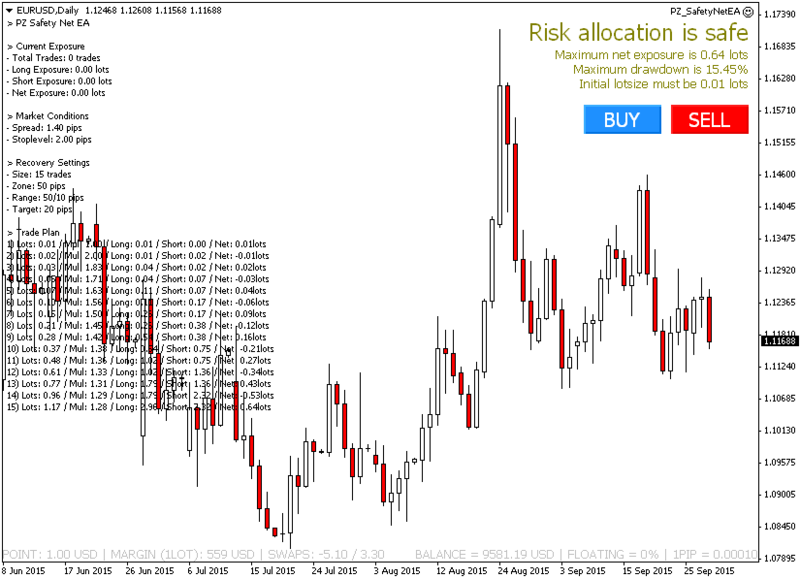 If the spread is above 3 pips, you need a zone of at least 100 pips. The behavior parameter instructs the EA how aggressive to behave during the recovery process. More aggression will close deals faster but use more free margin to do so. If this parameter is set to Do_Not_Add_Trades during live trading, the EA will stop adding trades and start to cut back exposure. Overall profit at which we wish to close deals. A bigger value will cause deals to last longer in time. Please note this is not the take-profit for the first trade. If enabled, the EA will start trades during the Assian Session. If enabled, the EA will start trades during the European Session. If enabled, the EA will start trades during the American Session. The magic number allows the EA to identify its own trades when reloaded or the platform restarts. As a rule of thumb, never change it. Enter your custom comment for all trades here. Is the EA NFA/FIFO Compliant? It is not, please do not trade with an US Broker. Do I need a VPS to run the EA? Yes, it is imperative that you do. The EA must be connected 24/5. No, you can't, because it would confuse the recovery mechanism. When entering a trade, please go only long or only short. Never buy and sell at the same time. Can I use pending orders to enter the market? Yes, you can. Once one of them becomes a market order, the EA will start working. Can I place two pending orders in opposite directions to enter the market? Yes, you can. Once the first one is triggered, the EA will delete the other/s. Can I interfere with the trades of the EA? Please don't. Let the EA do its job. All you can do is closing the deal completely. Will this EA interfere with other EAs running in my account? Yes, it will! It will manage all trades on the current chart. Is the EA fully automatic? This EA is not designed for fully automated trading, although it implements a few automated entries which you can enable or disable at will. Can I set my own take-profit and stop-loss when I enter the market? No, you can't. Please trade without stoploss or takeprofit. The EA will handle those.